Today's Astronomy Picture of the Day is a stunning graphical depiction of the results returned so far by the Kepler spacecraft. 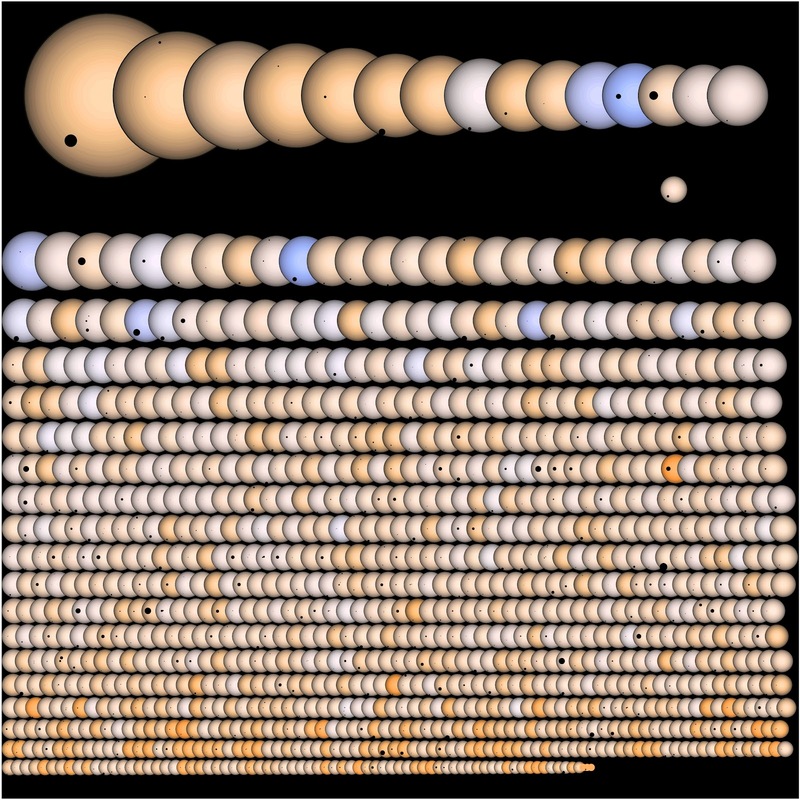 Kepler is staring at a small section of the sky within which it keeps track of the brightness of some 100,000 stars, watching for the slight change in light output that can indicate a transiting planet. 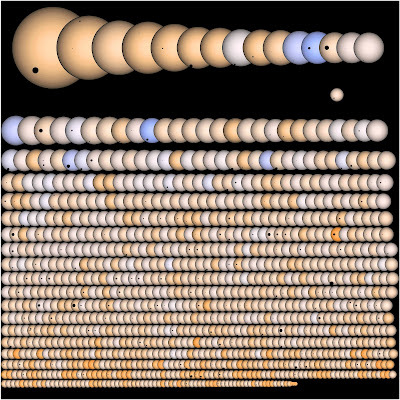 The amazing graphic shown above shows the number of stars for which transits have been detected, their correct relative sizes and colors, and the correct numbers and relative sizes of the detected planets (multiple planets for some stars). Our own sun is shown for scale at the far right, below the top row of larger stars. If you zoom in, you can see the silhouettes of Jupiter and our very tiny Earth on the sun's face. There is an incredible amount of information in this single image - it could be in the class of the famous graphic depiction of Napolean's disastrous invasion of Russia. The latest carnival of space is hosted this week by Centauri Dreams. I was supposed to host this week but a family emergency came up over the weekend, and Paul graciously agreed to host in my place. It's a small but very interesting collection of articles this week. Last week I did one of my occasional whirlwind customer tours in Europe, visiting six customer sites in France, Spain, the Netherlands, and Sweden in five days. There wasn't much free time in the schedule, but one of the customers happened to be ESTEC (European Space Research and Technology Centre) in Noordwijk, Netherlands (close to Leiden, not far from Amsterdam), and luckily there was an hour or so to kill before heading to Amsterdam to catch a flight to Gothenburg, Sweden. I say luckily, because ESTEC is also the site of Space Expo, a space museum that is also ESA's visitor center (the main Space Explo web site is in Dutch and has multiple pages and pictures - there's also an English site, but it's got very little content). This museum isn't as large as Cité de l’Espace (Space City), which I visited last summer in Toulouse, France, but it's pretty impressive nonetheless. In addition to the expected exhibits on the solar system, stars, space history, etc., there are a number of life-size satellite mock-ups suspended from the ceiling. There are also a number of interactive exhibits where you can launch simulated rockets and the like. 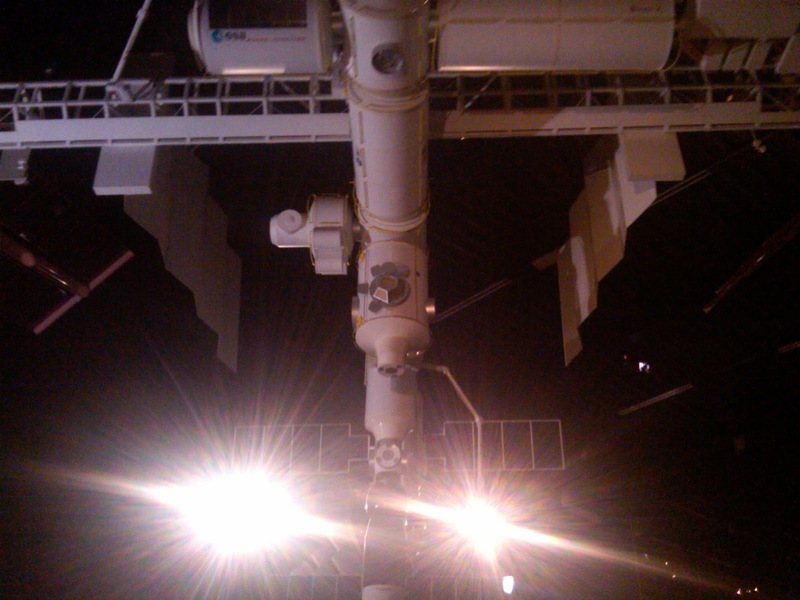 The ISS was represented by a cool model hanging from the ceiling (shown above with overexposed floodlights simulating a double-star solar system). But more impressive were the full size walk-through mock-ups of the Russian Zvezda and the European Columbus ISS modules (I realized again that the ISS is really, really big). There was also a life size Apollo Lunar Module mock-up on a simulated lunar surface with space-suited astronaut manikins for scale and (lack of?) atmosphere. 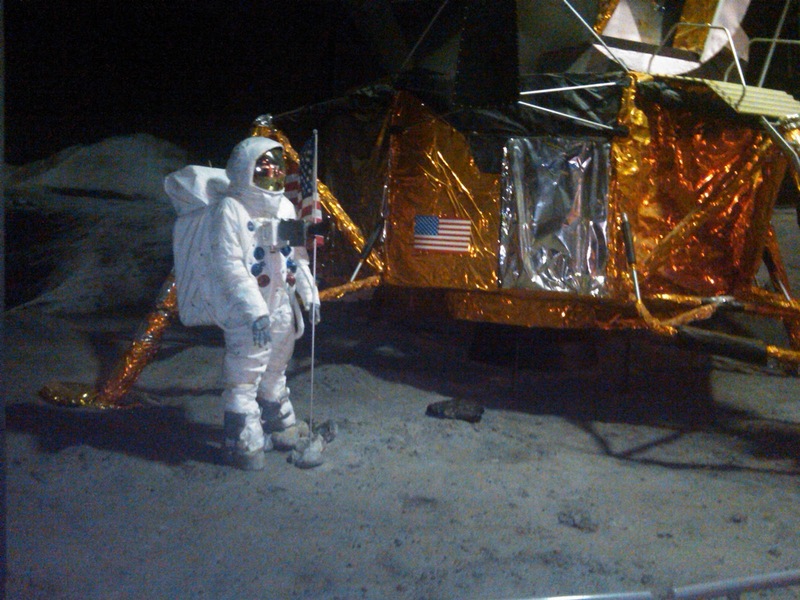 They have a nice collection of real space memorabilia including an Apollo moon rock, an airlock used on a shuttle Spacelab mission, and a section of the Hubble Space Telescope's first generation solar panels (returned on one of the servicing missions). There are some great large-scale models of Ariane launch vehicles (and full-size cutaway models of some Ariane rocket engines). I have a few additional Space Expo pictures on my Flickr site. Finally I had to spend a few minutes in the gift shop where I couldn't resist buying a couple of 3D postcards of some of Saturn's moons (from Cassini imagery) as well as a book I will likely never read. 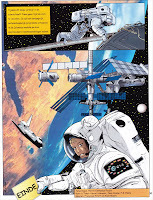 It's a "graphic novel" of sorts, and it tells the story of Tania, a fictional European astronaut, as she makes her way through the selection and training program and finally into space. The illustrations are pretty good, and it's nice to have such a story told in graphic form. Unfortunately the text is only in Dutch, which limits my ability to follow all the details (it appears that this book was also published in English, French, and German). The picture at left is the last page of the comic section of the book (there's a final section with photos of real ESA astronauts and more detailed text, all of which I cannot read).